Once the top way to travel overland, today's train trips still provide a very unique way to see the world. That's especially true in Canada's Rocky Mountains, where Rocky Mountaineer has welcomed almost two million guests onboard after more than two decades of varied train trips north--and, recently, south--of the border. This year, Rocky Mountaineer is celebrating the 25th anniversary of offering inspiring journeys through the Canadian Rockies and the Pacific Northwest. Since 1990, a train trip with Rocky Mountaineer has meant a great way to see some of Canada's most scenic landscapes--and to stay in some of Canada's best hotels and resorts along the way. Rocky Mountaineer likes to say their mission is to provide "Life Changing Experiences" for their guests by focusing on the "Four Ss" on their varied trips: Scenery; Service & Storytelling; Socialization; and Savoury & Sweet. Mission accomplished. Rocky Mountaineer started out with just one route and one level of service. Today, the company has 90-plus coaches and locomotives, five routes, 45 different vacation packages, three levels of service, and the distinction of being the largest privately-owned luxury tourist train in the world. Adding Seattle service in 2013 has made a Rocky Mountaineer trip--and Alaska cruise add-ons--even easier and more diverse. In fact, more than 40% of Rocky Mountaineer guests now choose to take an Alaska cruise. The trains now travel through seven mountain ranges: Cascade Range; Rocky Mountains; Coast Mountain Range; Cariboo Mountains; Selkirk Mountains; Centennial Range; and Premier Range. The length of the train varies with each departure depending on the number of passengers. The longest train in the lines history has consisted of 41 cars, excluding the locomotives. Along with drop-dead gorgeous scenery along the way, Rocky Mountaineer destinations include: Vancouver, British Columbia; Jasper, Lake Louise, and Banff, Alberta; and aforementioned Seattle, Washington. 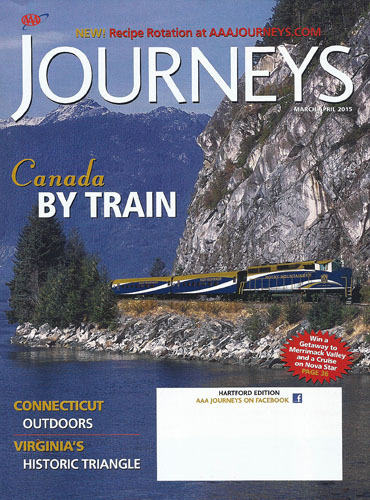 Their luxurious trains travel by daylight, with overnight stays in destinations like Kamloops, Whistler, Quesnel, and other fabled train stops. Situated in each train car, one or more Rocky Mountaineer Hosts provide background and stories along the way, as well as pointing out snow-capped mountains, waterfalls, sparkling lakes, and fleeting flora and fauna. Wildlife sightings might include bear grazing on berry bushes, big horn sheep, elk, mountain goats, soaring osprey and bald eagles, and Sockeye salmon which can often be seen as red flickers on the Adams River in late summer. The aforementioned five routes have names evoking the experience to be enjoyed: First Passage to the West (Vancouver - Lake Louise, Banff, or Calgary); Journey Through the Clouds (Vancouver - Jasper); Rainforest to Gold Rush (Whistler - Jasper); Whistler Sea to Sky Climb (North Vancouver - Whistler); and Coastal Passage (Seattle - Jasper, Lake Louise, or Banff). First Passage to the West continues to be the lines most popular route and remains the only passenger route on the historic Canadian Pacific track which united the country and connected British Columbia to the rest of Canada more than 125 years ago. Train and history buffs will enjoy highlights like the Last Spike (the ceremonial final spike of the Canadian Pacific Railway's transcontinental route driven at Craigellachie, British Columbia, in 1885) and the famed Spiral Tunnels (the use of tunnels and switchbacks to get up and down Kicking Horse Pass). Passengers can begin their journey in Vancouver or in Lake Louise, Banff, or Calgary. Journey Through the Clouds features unparalleled Rocky Mountains beauty, including Pyramid Falls and Mount Robson--the highest peak in the Canadian Rockies. The trip starts in Vancouver or Jasper, which is situated in Canada's largest national park and a UNESCO World Heritage site. Starting and ending in Whistler or Jasper, Rainforest to Gold Rush features widely varied landscapes. Highlights include British Columbia's coastal rainforest (the largest temperate rainforest in the world), Fraser Canyon's desert-like conditions, and the ranchlands and history of the Cariboo Gold Rush region. Scenic Whistler Sea to Sky Climb travels between Vancouver and Whistler in both directions. The route runs from the sparkling Pacific Ocean through old-growth rainforest to the stunning snowcapped mountain peaks of famed Whistler Mountain. All passengers on this trip have access to an open-air Heritage Observation Car. Coastal Passage in Rocky Mountaineer's most recently added route. It connects the United States with Vancouver and beyond via Seattle, which can be used as a starting/ending point for varying trips. Both Seattle and Vancouver have also proven to be particularly ideal ports of embarkation for Alaska cruises before or after a Rocky Mountaineer train trip. Culinary offerings onboard are better than ever. The onboard menus for SilverLeaf and GoldLeaf meals feature regional ingredients like fresh Pacific salmon and prime Alberta beef. Delectable meals are accompanied by British Columbia wines from the Okanagan Valley, as well as a selection of locally-brewed craft beers. In the bi-level dome cars of GoldLeaf Service, passengers head downstairs to the main level for breakfast and lunch in an elegant dining space. Those in SilverLeaf Service eat breakfast and lunch at their seats-with views through oversized windows. The destinations and overnight stops rival the history and scenery experienced along the way. From bustling cities like Calgary, Vancouver, and Seattle to the stunning landscapes of Whistler, Banff, Jasper, Kamloops, Lake Louise, and Quesnel, Rocky Mountaineer's destinations range from quite cosmopolitan to quaint and cozy. It's easy to further customize trips by adding hotel nights, tours and excursions, transfers, car rentals, full auto tours and much more. The large variety of trips are generally offered April to October. The west coast of Canada and Washington State features a temperate climate, while the Canadian Rockies feature more dramatic weather. July, August, and September generally provide the finest weather, but almost anytime is a great time to book a trip. *Since 1990, Rocky Mountaineer has carried lucky passengers more than 3.5 million miles--that's more than 150 times around the world. *Rocky Mountaineer chefs have prepared more than one million eggs and a half a million famed and freshly-baked croissants in the last 25 years. *The "Eat Play Love: Regionally Inspired Cuisine by Rocky Mountaineer" cookbook was published in 2013 and showcases regional fare available onboard. Past Rocky Mountaineer passengers have always raved about the cuisine onboard the company's trains and they now have a cookbook to enjoy many of those dishes once back home. The company's first cookbook, "Eat Play Love: Regionally Inspired Cuisine by Rocky Mountaineer," was released in 2013 to rave reviews. Delectable breakfast and lunch dishes served onboard Rocky Mountaineer's train travel offerings from the Pacific Northwest to the Canadian Rockies have become an integral part of the travel experience. Renowned Executive Chefs Jean Pierre Guerin and Fredric Couton recreated the train's onboard culinary journey in this collection of western-inspired recipes and photos, making for a perfect memento for travelers to take home and share with others. The incentive for creating the cookbook is easily found right outside the windows of the train as it travels through breathtaking scenery. Many of the 37 regional dishes--like Braised Alberta Beef Short Ribs, Lightly Roasted Wild BC Sockeye Salmon, and Forest Fresh Mushroom Soup--are served in the award-winning GoldLeaf Service dining room onboard. There are also several bonus recipes that are perennial personal favorites of the Rocky Mountaineer culinary team. Each dish is easy to prepare and all of the ingredients (like Alberta beef short ribs, salmon, or mushrooms) can be substituted with locally-sourced products from other regions.